Just a short post today to remind you all that every moment you spend being kind to yourself has a multiplier effect. This is something I’ve talked about many times in this blog, but it’s worth repeating. If you think you’re being selfish by taking the time to nourish your own psyche, think again. You can’t give what you haven’t got. The benefits of taking an exercise class, for example, can have an impact beyond improving your own health. It can lift your mood, give you extra energy, and help you to feel good about yourself. Your body will thank you for enabling the movement of muscles, bones as well as improved blood flow and brain activity. All of these good feelings will radiate out and impact everything around you. Whatever you do afterwards can be accomplished with greater ease and clarity. Also you’ll be setting a positive example for everyone you encounter. And the people you interact with may have a better day themselves because of your influence. They will then spread their good feelings. And so on, and so on. The simple act of taking an hour or so to focus on yourself and your own well-being can have far-reaching effects. Seems like a bargain to me! 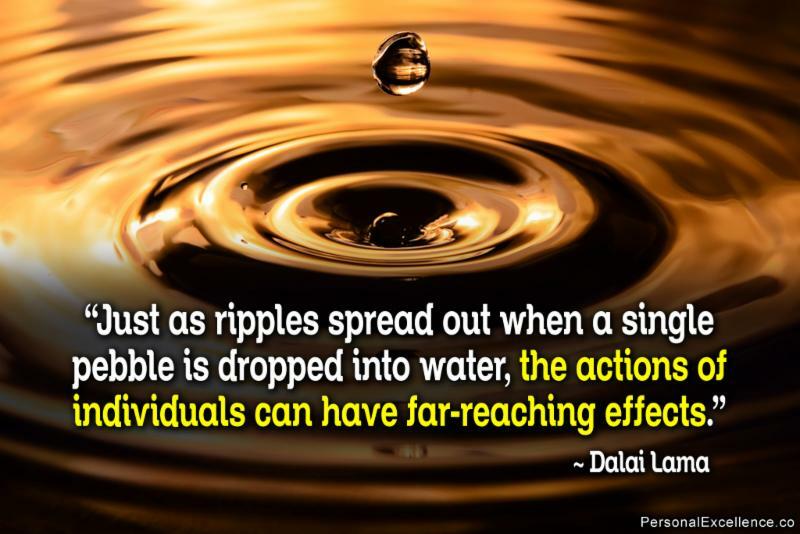 Your ripple effect may even result in positive outcomes that you don’t even know about. We all have numerous demands on our time. It can be difficult to prioritize when everything seems so important. Recently I listened to an interview with Buddhist teacher Stephen Batchelor on the program “On Being“. Among other things, he talked about a practice he had learned in which he would reflect each day on the following: “Death is certain; its time is uncertain: What should I do?” A call to action of sorts. How can we maximize our limited time here on the planet? It is obviously important to do what we can to help others and make the world a better place. But in order to do justice to that huge task we each need to be at our best. Contribute to your own well-being and the world will benefit.